How Affordable is a Sunroom? If you are like most homeowners, you’ve probably said to yourself more times than you can count, “we need more space,” right? Many families begin to outgrow their homes at some point in time but moving to a larger home isn’t always an easy option. The obvious alternative to moving is to add space to your existing home. The question is, can you afford to do it? The cost of adding additional space to your home is truly dependent on what you want, conditions of your existing space, local building codes and what it will take to bridge the gap. Traditional room additions such as adding on a master bedroom suite or bumping out the kitchen, dining area or living room are without a doubt, big ticket items. But if you are looking for added space to relax or entertain in, there are alternatives to traditional room additions. Sunrooms, screen rooms, porch and patio enclosures can all give you added space without the complexity of a traditional home addition. Plus sunrooms tend to cost less and install much quicker than their traditional counterparts. If a sunroom could give you the added space you want and need, the next question is, can you afford it? Unlike many general contractors or local handymen who require cash for home additions, Patio Enclosures® has partnered with GreenSky®, a leader in home improvement lending. We offer payment plans that help your project fit within your monthly budget. To buy a latte and a muffin on a daily basis from your favorite coffee shop costs roughly $6.25, especially if you choose the grande with all the fixings! Over the course of the week, you’ll spend roughly $43.75, and over the course of the month, you’ll spend around $187.50! For some, this little guilty morning pleasure is well worth the cost, but for the same monthly cost, you could be enjoying your new sunroom! 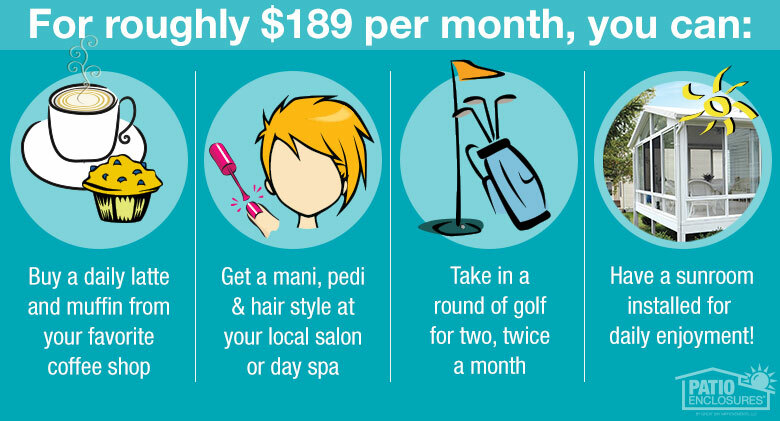 To take a once-a-month trip to the salon/spa for a manicure, pedicure and hair style with tip can easily cost well over $200, depending on where you go and what you have done. For many, the self-pampering is a necessity, but for the same monthly cost, you could be enjoying your new sunroom! On average, the cost of a round of golf for two at a public course is approximately $85. Add in a few drinks and your cost for the day could easily push $100. Play golf two times a month, and you’re looking at a total spend of $200 dollars. For roughly the same monthly cost, you could be enjoying your new sunroom. We’re not suggesting you cut out the things in your life you love to be able to afford your perfect sunroom space. We’re simply saying that a sunroom or screen room could give you the additional space you want, and, more than likely, is affordable, given our financing options! If you’re ready to explore a sunroom or screen room addition for your home, consider Patio Enclosures. Our custom rooms have been helping homeowners create their perfect spaces for over 50 years. If you can dream it, more than likely, we can build it. To schedule a free, no-obligation design consultation with one of our product experts, simply call 1-800-230-8301 or schedule online. 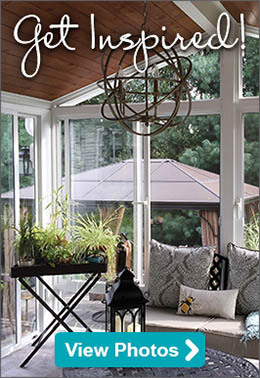 Check out the photo gallery of our work to gain inspiration for your custom sunroom.